Relaxing in the midst of natural surroundings is an activity that can lure any nature lover, especially if one gets a chance to go camping in the remote Himalayan regions of Himachal. This camping expedition gives one a chance to enjoy the luxurious beauty of the mountain lands in its originality. From Shimla (1,920m) drive through the breathtaking gorges of the Greater Himalayas to Kalpa (2,900m/290-km). Looming in front of Kalpa is the impressive Kinner Kailash (6,050m) this mountain changes colours several times a day with change of weather conditions. Overnight at Timberline Trekking camp in Kalpa. Drive to Recong Peo (2,290m/13-km) and the new Buddhist monastery built to commemorate His Holiness Dalai Lama'' Kalchakra sermon and onward to the ancient village of Pangi. Drive back to Kalpa and take a short trek to village Rogi, lunch will be served en route. After tea at the trekking camp in Kalpa walk to Chinni village. 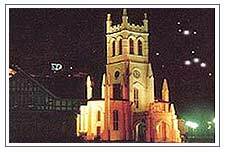 These villages offer a good opportunity to observe the lifestyle of the inhabitants. Return to the camp for an overnight stay. From Kalpa drive to Baspa valley also known as the Sangla valley, it is by far the most beautiful valley of Himachal Pradesh full of wooded slopes as far as Chitkul (3,435m/80-km). Overnight stay at the trekking camp in Chitkul. Trek through the lush green meadows to the grazing fields of Nagasti on the bank of river Baspa, after lunch on the riverbank return to the trekking camp in Chitkul for overnight stay. Drive to Sarahan (1,920m/122-km) a beautiful village surrounded by apple orchards and dominated by Shrikhand Mahadev Peak (5,155m), which resembles a Shivling and is famous for the Bhimakali temple. Overnight stay at a hotel. Drive to Shoja via Jalori pass. Shoja is a small village 108-km away at an altitude of over 8,000 ft. The access to Shoja winds through thick forests alpine trees, which provide an untouched habitat to various species of flora & fauna. On arrival at Shoja, the landscape opens up into beautiful terraced fields followed by rolling meadows of wild flowers. One can explore the surroundings on bear trail, pheasant ridge or village trail. Overnight stay at the campsite. Early morning trek along the road to Jalori pass (4-km/10,280 ft.) where one can appreciate the nature's bounty. A temple of Mahakali called Jalori Mata attracts a lot of pilgrims from faraway villages. After breakfast, trek to Raghupur fort ruins with packed lunch. The trek offers breathtaking views of the area as one crosses over the ridge. They unfold many legends of the past. Return to Jalori Pass in the evening. Dinner and overnight stay in the tents in the meadows adjacent to the pass. After breakfast trek to Sereolesar Lake through a thickly forested narrow path. One can have an occasional view of the meadows beyond the thick curtain of the forests. The onward trek is smooth and downhill. A little before the lake, the alpine meadows dotted with the sheep of Gaddis give ample opportunities to a photographer on an artist. The Sereolesar Lake is worshipped and there is a temple of a deity called "Burinagin", who according to the legend had 100 Snake sons. After lunch trek back to the camp, which is an uphill and a little taxing walk (5-km). Arrive in the evening, dinner and overnight stay at the camp. An hour's drive to Goshani through the beautiful valley of Tirthan. Goshaini is a small village located in Tirthan valley along the banks of river Tirthan. 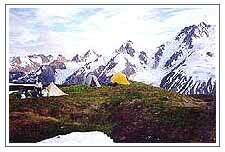 It is the starting point for the treks to Bachleo Pass and the Great Himalayan National Park. Apple, pear orchards and the hills around add to the serenity of the village. The place is tremendously rich in birdlife. One can go fishing to one of the finest beats at Larji, which is just about 35-km away. Depart / fly in the morning.